Each year we make a number of awards recognising those who have achieved the best outcomes during a funded expedition. These awards are presented to both Cadets and Reservists at prestigious events throughout the country. 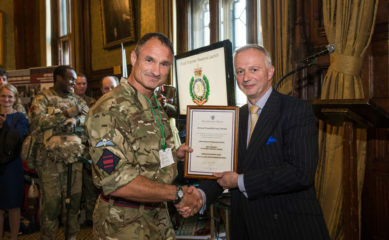 Pictured right is the 2013 award for Best Reserve Expedition Photography presented at the House of Commons to WO2 Dave Bellamy of 299 Para Sqn RE (V) by our Chairman AVM Nick Kurth CBE. Other awards were presented by Lord Lieutenants and regional dignitaries at special ceremonies close to the winning unit locations. If your company would like to sponsor a future award, including naming rights, close involvement with the award presentation ceremonies and associated PR, please contact us using the form below.